So, I’ve been back since Saturday and slowly getting my momentum again. I’ve finally updated my Legacy, woohoo! The hood is functioning again, so that’s good. I’ve also got Generations and I’m enjoying it… aside from the annoying memory system. 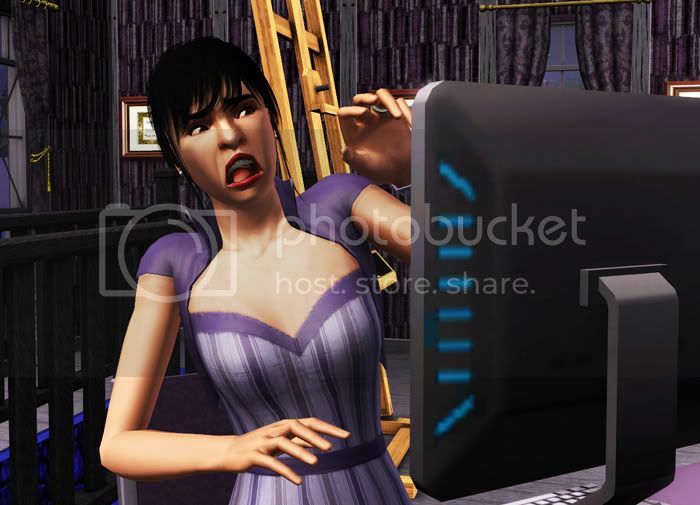 Leave it to the TS3 team to take something great from TS2 and make it ridiculously annoying… sigh. I’m probably going to focus mainly on finishing out my legacy before trying to recover any of my old hoods or start up anything new. I’m also slowly looking to upgrade my PC, too, so there may be some pauses and shifts going on in the coming months. Also, for those who tried to access any part of my domain (maonao.net) and were greeted with ‘Account Suspended’… seems one of my wordpress add-ins got hacked or something and sent out massive spam mail. It’s all been fixed. Here’s hoping this is my last huge break. To be honest, this is the longest break I’ve ever taken in my entire simming career (which started over a decade ago, February 4th, 2000) … I was afraid I was done for good. There’s multiple reasons I fell out of love with something that had been such a huge part of my stress relief and fun times, but it’s really not worth getting into. All that matters is I’m back and enjoying my play time again. Yippee! I’m so happy to see you back again! It’s me again. By the way, have you uploaded Donovan family to the exchange? I really want to play Laurel and Brayden’s family and also Emma. I miss them ^^ and maybe they could pop in in my story. I’m not sure if I mentioned it, I think I did but it’s been a long time, but I actually lost that hood and all of the sims in it. It was one of the first huge game issues I had. Something with the hood file got corrupted and refused to load, no matter what I did. That’s why I never continued the story, I lost the hood in its entirety. Soo sooo soooo glad to see you back Mao! I’ve sorely missed reading your updates and am very excited to see more from you! Welcome back! Hey there, Mandie! Thanks. I’m definitely glad to be back.